Crispy Sugared Pecans are a sweet and crunchy snack that is great to top your yogurt, your ice cream, or just to eat by the handful! When people in the south talk about nuts, the kind we eat not the people we hang out with, we are usually talking about pecans. I grew up saying PEE-CAN, which is fine, but some people say PA-CAHN. Not really sure if there is a correct way to pronounce it, not that I am proper anyway, so I’m going to say it how I want to. Where can I get some pecans? Living in South Georgia they are literally falling from the trees!! Because they are so plentiful they are my nut of choice for baking time. Pecans are a staple for my baking and my Ma had a great recipe for Fall Spiced Nuts, which I shared last year but used walnuts for a change-up. She made for everyone, along with Ma’s Benne Candy, for the holidays. 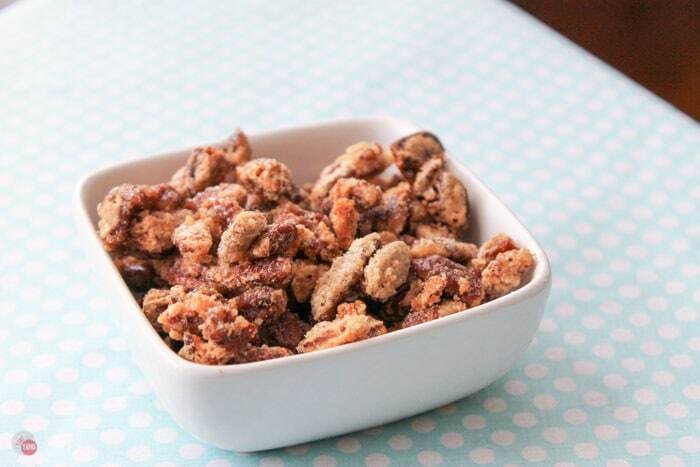 Today I’m going to share a recipe for crispy sugared pecans for two reasons. How do you like your pecans? I love pecans and I REALLY like them crispy and sweet. They are great for munching at the movies and by the number of times I talk about the movies, you can tell I see quite a few of them! 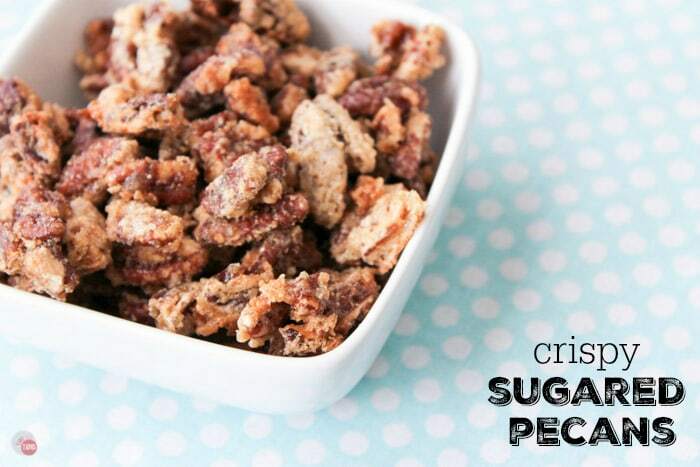 How do you use Crispy Sugared Pecans? I use them in my Mind Blowing Banana Pudding recipe. The pudding recipe has a few different parts to it and I didn’t want to bombard you with a bunch of different recipes to make one dessert. Also, the banana pudding recipe only uses about a cup of sugared pecans and when I do something like this I want to make a big batch and keep them handy for other things! Make a big batch of sugared pecans! Doing things in big batches and saving for later makes prep work and weekday cooking so much easier. 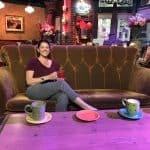 With boys in school and a husband that travels, I need all the help I can get! 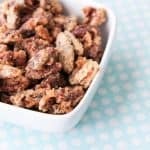 This recipe only takes 30 minutes but you can reap the reward of having a large batch of crispy sugared pecans ready to step up to the plate when you need them!!! 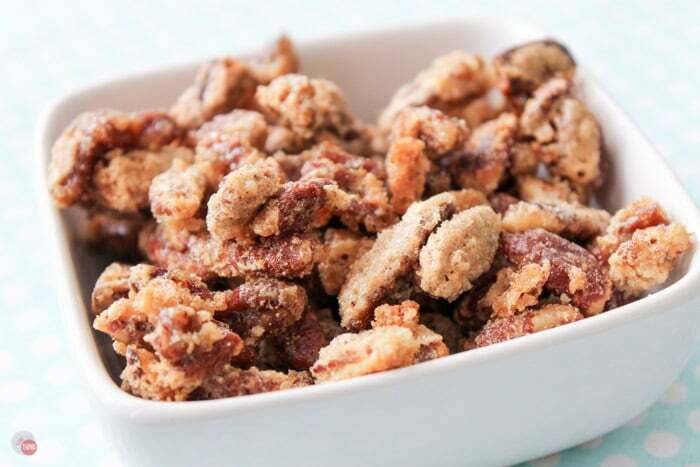 If you are nuts for these Crispy Sugared Pecans, try these nuts? How do you pronounce pecan and are you going to eat the whole batch of these crispy sugared pecans? 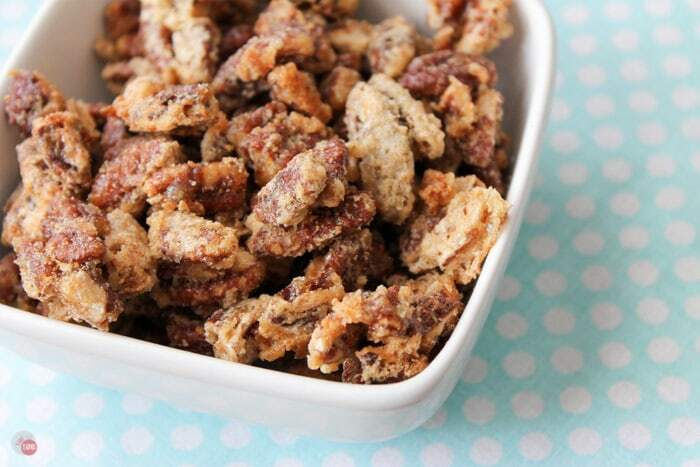 These crispy sugared pecans are a great addition to yogurt, puddings, french toast, and many other things. Make this one big batch and you will have them on hand when you are ready! Preheat oven to 350F and cover a baking sheet with foil and spray with non-stick spray. Mix the sugar, pecans, egg whites, and vanilla in a large mixing bowl. Toss the pecans in the sugar mixture to coat the pecans. Bake at 350F for 20 minutes, stirring halfway through to ensure even cooking. Nuts are my go-to, gotta-have-something-in-my-belly-right-now snack, and I LOVE the idea of adding a little sweet to these crunchy treats, too! These are crack!! I can smell them already. I’ll have to make and take so I don’t eat them all. Oh wow! Is it really that simple? Why have I never made these! So great on their own or tossed into a salad! Thanks for sharing! Making these this week. These look absolutely amazing! Truthfully I thought they were harder to make, so I’m glad you shared this recipe separately. Totally do-able! YUM! Thank you! I love them! I was scared when I started making them as they look weird with the foamy egg whites but it makes the best crust! I buy big bags of pecans from Costco, but boy do I wish I had access to pecan trees. These candied pecans are so simple to make and I love packaging them up for gifts! Candied pecans are the best…and crispy is important! These would be addicting! They’d be great to munch on at a party or really tasty on a salad! I love candied pecans too, they’re the perfect snack. I’ll look forward to your mother’s spiced pecan recipe closer to the holidays. Thanks! I know you will like those too! I love pecans especially crispy candied pecans. I could sit down at any time and shove them into my face by the fist full! Thanks Miranda! I shovel mine the same way! I have to make So many batches!! Thanks Pam! I love them on my yogurt! These sound divine. We moved to Georgia a few years ago, the best pecans. Thanks for reading Christie. I do love me some pecans! These look so good! Pecans are my nut weakness….yum! Me too! Pecans and cashews! Thanks for reading. i love these. i want to make them. they are a yummy snack! Thanks! My grandmother made these and the Fall Spiced Walnuts every year and gave them away as gifts. They are easy to make and go fast so make a double batch!